Special order, shipping leadtime is 1-3 weeks for less than quantity 2 order. For 2 pails or more it can be drop shipped more quickly directly from the factory. Quick Return to Service Time. Very rapid strength development helps minimize traffic disruption. 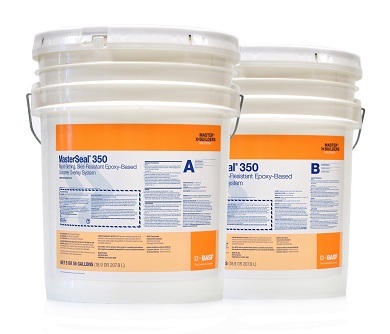 Waterproof to prevent chloride ion contamination, freeze-thaw damage and salt scaling. 90% lighter than typical concrete overlays to limit dead load in suspended structures. Excellent adhesion to the substrate to prevent delamination and extend surface life. Skid resistant increasing safety for vehicles and pedestrians. One to one mix ratio by volume simplifies application. Durable surface extends service life. No primer required for faster installation.